Chess Opening Trainer 1.1 free download. This software will help you learn and remember chess opening theory faster than ever before. This software will help you learn and remember chess opening theory faster than ever before. In addition, you can use this software to build your opening repertoire. 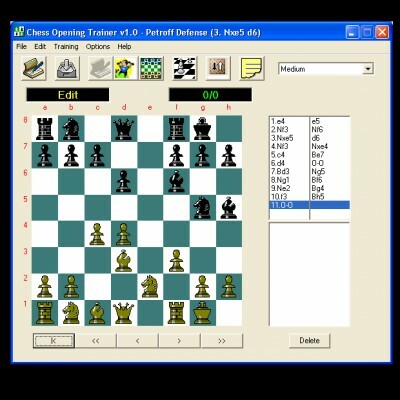 Unlike the other chess training software, Chess Opening Trainer does not randomly select training moves and positions. It smartly selects and serves the training move and position which you had difficulty in solving. This way, you concentrate to strengthen your weak points and reinforce what you already know in the opening line that interests you. If you have ever looked up your opening moves in the chess opening books then Chess Opening Trainer will change the way you study the openings. If you struggle with published chess theory you will squeeze even more from this tool. One of the traditional methods of studying an opening is to get a book about your favorite opening and play the moves and variations over the board as you read. There is no way to find out how much you learn and remember. You spend valuable time shuffling pieces and sifting through book pages to get to important positions. Most of the time, you believe that you have learned the moves and variations until you encounter the same variations during a match and forgot the proper continuation. You have read the same chess books over again and found that you were studying it all over. Chess Opening Trainer eliminates all of these problems, and more! Chess Opening Trainer will help you locked in the theory down in your memory. Chess Opening Trainer builds on the time-tested educational technique of learning by doing. You train against the computer by playing the exact opening lines you want to learn. Hot File program helps you to open the most frequently used file clicking on a system tray icon. If you want to play FAST.